Amazingly, there are so many wonderful creative people who make all sorts of amazing things — but are afraid to draw. In this week’s episode of my new podcast, art for all, I tell the story of one and how he overcame his fear. You can listen to it here but please subscribe wherever you listen to podcasts. Hi and welcome to art for all the Sketchbook Skool podcast. I’m Danny Gregory. Now, the idea behind this program is to inspire your creativity and to help you to make all the things that you’d like to make. So while you listen, make something! It could be a sketch or a painting. It could be a huge marble sculpture. It could be a doodle in a little notebook. You might knit a sweater. You could build a bookshelf. You could bake a pie. It’s up to you. And while you create, I’ll tell you a little story just to keep you company. It’s called the artist who couldn’t draw. Once upon a time there was a man who had a deep creative itch. He just loved to make things, all kinds of things. Roger built websites and dog houses. He knitted himself colorful sweaters. He made his own holiday cards and cookies, decorations and gifts. He made sculptures out of old tin cans and rusty clock gears. He filled notebooks with complex doodles and zentangles. He recorded his thoughts in art journals thick with layers of paint and collage, embellishments and rubber stamps. He had a meticulously designed flower garden. He handbound scrapbooks and filled them with perfectly composed photos and rich calligraphy. He wove and sewed gorgeous textile art. He made silver cloisonné necklaces for his friends. He covered huge canvases with blazing abstract paintings. Every weekend he took classes and went to workshops. He dyed his pants pink, his hair blue, and his glasses red. He listened to eclectic radio stations, subscribed to art magazines, and attended gallery openings. Roger had gone to art school. He had studied design. All his friends and coworkers thought he was super creative. But he had a secret he’d never shared…. One day, a new family moved into the house next door to Roger. They had a little girl named Chloe. Chloe also loved to make things. All kinds of things. She sang songs and danced, wrote stories and plays. But most of all, Chloe loved to draw. She loved to draw everything: dogs and planets, airplanes and clowns. One day Chloe rang Roger’s doorbell and asked if she could draw some of the flowers in his beautiful garden. As she sketched, Roger brought out some blueberry lemonade and tiny yellow cupcakes. He sat down next to Chloe and admired her drawing. “Just try,” she said, and held out the pencil. So Roger drew a flower and showed her. Chloe smiled and reached into her pocket. “Then you need my magic pen.” She handed him a black pen. It looked pretty ordinary but on the side were the words “Magic Marker” in white letters. “But I can’t draw,” frowned Roger. So Roger took Chloe’s magic pen and every morning he sat down with a sketchbook and drew something. His dog. His shoe. His piece of toast. At first, the pen didn’t seem to work. All the drawings were crooked or lumpy. They didn’t look much like his dog or his shoe or his toast. Roger almost gave up. “I just can’t draw,” he said in frustration. After two weeks of trial and error and lots of crumpled up paper, the magic pen finally started to work. One morning, Roger drew his teakettle and y’know, it looked pretty darned good. So he drew his armchair. Kinda great. Then he drew a pineapple, his toothbrush, the TV set, his corduroy jacket. Magic! One night, the moon rose full and bright over Roger’s house. He drew it through the kitchen window. It was a really magical drawing. There was a knock on the door. It was Chloe. “The magic pen is really working,” Roger smiled. “It’s amazing!” He showed her all the drawings he’d done. From that day on, Roger drew and drew. He drew Chloe, her parents and all his neighbors. He drew the sweaters he planned to knit. He drew his favorite dishes and published a cookbook. He drew designs for his garden. He drew his mailman, his dentist, his cat and all his coworkers. He went on vacation and drew all of Rome. He drew and drew until, one day, the magic pen ran out of ink. “I’m so sorry! I wore it out,” he said sadly as he gave Chloe back the lifeless pen. I hope you enjoyed the story and I hope you got some creating done while we were hanging out together. I hope you made something really cool. Let me know if you did. Would you like to learn to draw like Roger? You can! 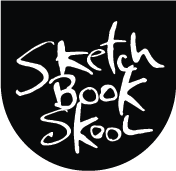 I teach a course at Sketchbook Skool and it’s called “ How to draw without talent” and it works even if you have talent. It’s launched thousands of people who couldn’t draw a straight line into a passionate drawing habit, and it can get you going too. Thanks for joining me again for art for all. I’ll see you next time and meanwhile keep making great stuff. Thanks for this story. It will be remembered.